SHELL-BG, A NEW WAVE OF OIL M&A IS COMING? On the morning of the 8th of April 2015 the acquisition of BG Group by the Anglo-Dutch oil giant Royall Dutch Shell was announced. It is considered to be the most expensive oil and gas deal in the past decade with an estimated value of around £47.0 billion ($70billion U.S. dollar). Shell agreed to exchange 0.4454 B shares for every BG share it acquired as well a cash sum of £13.2bn ($19.6bn). This equals to 1350 pence per share with an approximately 52 percent premium (of the closing price of BG stock price on April 7th). The affiliation is based on a weighted average BG share price of 890.4 pence during a 90-day trading volume. BG shareholders are to acquire 19% of the combined group. 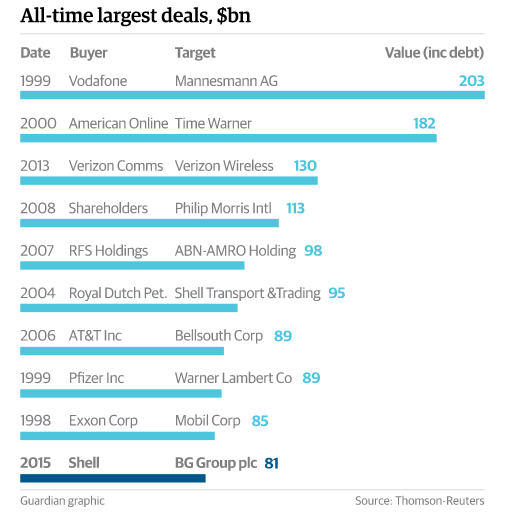 Overseeing the deal are Goldman Sachs, Robey Warshaw for BG-Group, and Bank of America Merrill Lynch for Shell. The deal marks the opportunity to rework the shareholders long-term options. Shell is targeting a $30bln asset sell, provisioned for 2016-18 as well as a buyback of at least $25bln scheduled from 2017 to 2020. It is done in an effort to reduce the amount of equity issued during the takeover (an increase in equity of 1532 million “B” shares). It is speculated that is done to possibly rejuvenate its stock price. Shareholders expect this deal to emanate a positive impact on their P&L with an increase of $2 billion post-tax. Shell promises “to pay dividends of $1.88 per ordinary share in 2015 and to maintain, if not increase that number for 2016”. It is speculated that Brent crude price will retreat to $90/b. by 2020. Shell’s combined group deep-water and integrated gas operations could potentially generate a $15-20bn. At the same time another $10bn a year is expected to be profited from its “long-term position”. The main catalyst for this deal is the opportunity for Shell to gain access to the fast-growing liquefied natural gas business of BG, which will make Shell the world leader in LNG with more than 18% of the total word’s production and the control of important strategic infrastructures. The deal will also allow Shell to enter in the promising business of deep-water oil projects, where BG is instead well positioned. In fact, BG has made a huge investment in one of the largest and most promising offshore project in Brazil. BG is well positioned not only in Brazil, but also in other countries such as Kazakhstan, Australia, Thailand and Trinidad & Tobago. In particular, a BG’s giant project is the Queensland Curtis LNG in Australia, where the company will use an innovative method to product gas from coal. The addition of these and other projects to Shell’s portfolio will help the company in increasing its total production, which has been stagnant in recent years. The amount of total reserves will also rise by more than 25% by adding 4 billion barrels of proved oil and natural gas. Another important driver for this deal comes from the operating synergies that would allow the Shell to cut overlapping costs and, as a consequence, to lower the breakeven production costs of oil and gas. Shell has recently planned to sell $30 billion in assets between 2016 and 2018 in order to create a more efficient organization. The estimated PV of synergies is calculated in 2,5 $ bn a year. The Royal Dutch Shell – BG Plc deal is strictly related to the development of the natural gas division, LNG in particular, in which BG Plc is one of the leading companies. Natural gas is currently the third energy source all over the world, after oil and coal. Natural gas in 2012 accounted for 21.9% of the global energy consumption, while coal represented a higher share, 29%, just after oil that arrived at 31.4%. Considering only developed countries, OCED, natural gas becomes the second source of energy, just after oil. Coal still represents the most important fuel in emerging markets because of its low cost and great availability, but its high environmental impact is becoming less and less sustainable. Natural gas has some key advantages that make it the possible “bridge fuel”: the energy source that will guide the transition from the fossil fuels era to the next, not so close, renewable energy era. The low level of polluting and carbon dioxide emissions makes this fuel environmentally friendly if compared to coal and oil. Environmental issues are becoming relevant also in emerging countries, where highly polluting coal is still the first energy source. China, for instance, is pursuing energetic policies that tend to reduce the coal dependence and to substitute it with natural gas. Natural gas accounted for only 4.9% of China’s total energy consumption in 2012, but large investments in domestic production and infrastructures, along with growing imports, are likely to underpin a significantly larger role in the future. The Chinese government anticipates increasing its natural gas share of total energy consumption to around 8% by the end of 2015 and 10% by 2020. The investments of the Chinese government in natural gas infrastructures are important, considering the LNG regasification plants under construction and the mega-pipeline that the government has just agreed to build with Russia to increase its imports. 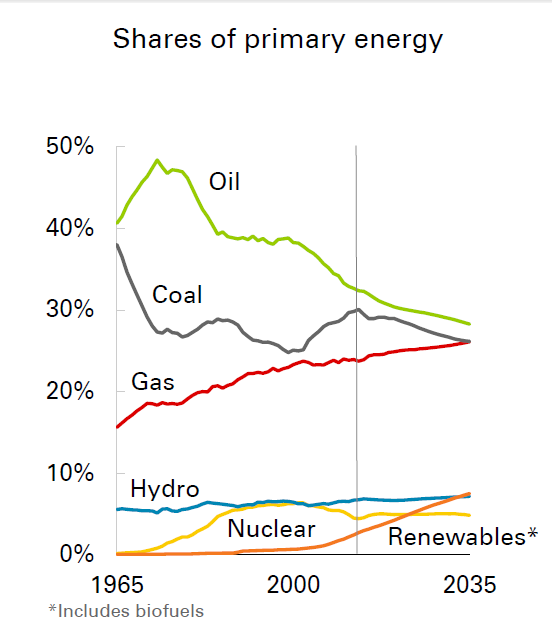 According to the BP Energy Outlook 2035, in the 2015 – 2035 time frame, natural gas will be the fastest growing fossil fuel, at a pace of 1.9% per annum, while oil and coal will grow by only 0.9% and 0.8% per annum respectively, making fossil fuel consumption shares almost equivalent. Another important element to consider is that natural gas deposits are more homogeneously distributed all over the world: thanks to the significant amount of reserves in non-middle east countries and non-major oil producers territories, it allows import diversification in terms of geopolitical strategy. The main problem concerning natural gas is that it cannot be easily transported from the extraction fields to the consumers, because of its physical nature of gas. The only ways to connect production sites with consumers are pipelines and LNG tankers. The use of pipelines is currently the most important shipping method of natural gas to consumers: particularly relevant are the networks that connect Western Europe to North Africa, Russia and Eastern Europe, the pipelines between Canada and USA and the planned one between China and Russia. The use of this kind of connection is not flexible and implies long term solid relationships between countries: as seen with the EU-Russia-Ukraine case, it can become a major political and geostrategic issue. LNG, on the opposite, allows more flexible shipment contract and agreement and diversification of sources even in the short term. The key element that will determine the success of natural gas as a leading energy source for the next 30 years is the ability to develop the LNG (Liquefied natural gas) infrastructure to receive and process shipments of liquefied natural gas. It would increase the possibility for natural gas to reach also small markets and to satisfy temporary and variable demand. 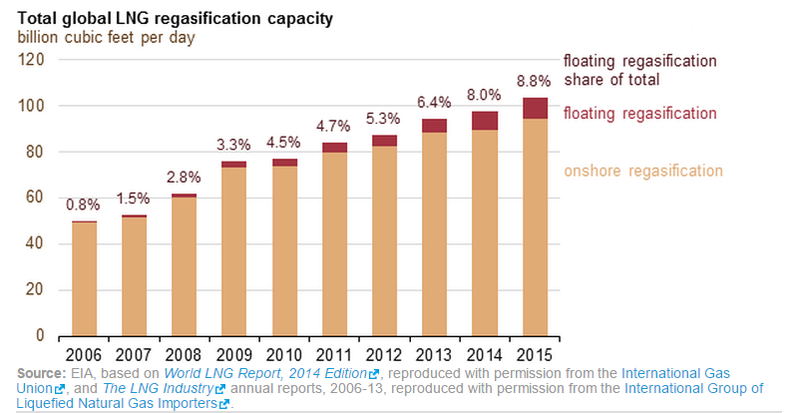 The LNG infrastructures are mainly LNG tankers and regasification plant: technologies are improving and the increasing number of offshore floating regasification facilities, made also with converted LNG tankers, extremely flexible and cost efficient, is significantly increasing the global regasification capacity and the LNG market. Global trade in liquefied natural gas will exceed $120 billion this year, taking it past iron ore as the most valuable commodity after oil, Goldman Sachs Group Inc. said. 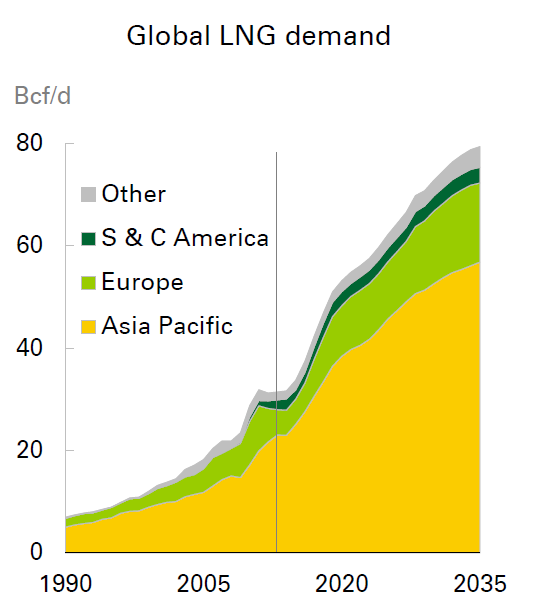 About one third of the additional demand of natural gas from now to 2035 will be shipped as LNG and mainly to Asia. The pricing of natural gas is depends on the market we are considering. In the US the benchmark price is the Henry Hub price, set in a major distribution hub in Louisiana, and is determined by natural gas fundamentals. The price of most of the natural gas sold outside North America is linked to the price of oil (generally Brent or the Japan Crude Cocktail) and not directly to its fundamentals. Today, almost 73% of the LNG is sold through long-term contracts linked to the oil price and only the remaining part (mostly shipped to Asia) is sold spot. Competition will increase because the spot market is expanding and buyers are less reliant on long-term contracts. The U.S. will supply more LNG in the next several years, giving Asia, the biggest consuming region, more bargaining power. The higher the difference between spot and contract prices and the liquidity of the market, the higher the incentive to leave the oil-indexation pricing: these conditions could allow natural gas to become a commodity traded and priced on its fundamentals and not depending on other commodities. The increasing liquefaction and regasification capacity installed will outpace demand growth for the next years, keeping spot prices at a significant discount to oil-indexed prices and helping the development of the market of LNG. Since the fall of the oil prices over the last six months the expectations of a new oil M&A boom has been growing in the markets. Many believed that low oil prices would lead to a wave of mega mergers as the one that happened at the end of 1990’s that created the major oil companies we have now such as ExxonMobil, Chevron, BP, and of course Royal Dutch Shell. Several investments banks believed that this boom would start at the end of 2015 and continue over the 2016 as the oil prices are still too volatile and the volatility clearly doesn’t allow a favourable environment for a M&A wave because it cerates uncertainty in the valuation process. However first the $8.3 bn deal between Repsol (Spain) and Talisman Energy (Canada) and after the Shell-BG deal, anticipated those expectations. Therefore at the moment in the oil sector the question is who’s next? Small and medium size oil companies are seen as potential targets because at the current oil prices, their costs level and debt are becoming unsustainable while the major oil players still have the financial strength to complete those acquisitions. Among big players, ExxonMobil is seen as a potential bidder for another leading company in the industry for many reasons. First of all ExxonMobil is the leading industry in the sector and it would have the financial capability to complete a big deal (low debt level and triple A credit rating). Second ExxonMobil could take advantage of this situation of low oil prices and low interest rates to obtain high quality assets at a reasonable price and diversify its portfolio in new projects (as shell did, gaining an exposure to Brazil deep water oil). A controversial and interesting issue regards BP and the UK government. The English company has always been considered vulnerable mainly because the high bill related to the Deep-water Horizon disaster in the Gulf of Mexico, and therefore it has been considered a potential target for a long time. However this scenario is seen very unlikely as recently the UK Government clearly stated that they are going to oppose every potential foreign takeover in order to keep BP a British company.